ArCH ProjAccount™ stands for Project Accounting. This is Not database oriented. This is strictly Excel 3D spreadsheets, in one file, with interconnected dozens of sheets (in the 1 file), directly reporting to each other. There’s a Master Invoice List, where all the individual invoices report their amounts for hours, fees, reimburseables, and a summary of the work accomplished in each invoice. All the invoices (39 of them) are preformatted and ready to go. The main Invoice List is 99% automated, reporting what all those invoices were for and how much and when. Not intended to be a “QuickBooks” sort of program. This instead focuses on how Architects think and how their estimate fees relate to what they’ve billed and ease of use. And each invoice is highly automated, taking the drudgery out of billing. If you know how to operate a spreadsheet, you already know most of this application. This is the webpage for the ArCH ProjAccount™ (Project Accounting) form. $300 ArCHmembers, $500 non-members (join ArCH and reduce your cost). This is a MS Office Excel 2013 file template for the PC running W7-W10 OS on a 64-bit computer. You may or may not be able to import this file into your computer if you are running software and hardware different than indicated above, however ArCH only indicates proper functioning of the file in its native software & hardware stipulated above. Apple-Mac computers and OS are Not recommended and have Not properly loaded or migrated the products offered herein (with a few possible exceptions, subject to some formatting issues). We recommend that if you are Mac/Apple based that you do Not attempt to use these products, as ArCH cannot assist you in loading and migrating the files and cannot issue refunds once you have the electronic files. Your choice to do otherwise is your decision. Are you ready to simplify your project invoicing and project account needs? Not until you have ArCH-ProjAccount™. ProjAccount™ includes a complete list of the project invoices (comes with 39 preformatted and ready to use: 15 for Programming through Construction Documents and another 24 for Bidding through Construction Administration, which should handle even large residential architectural projects. Specially tailored to residential project billing and tabulation of those invoices onto a master invoice list. This is Not a database complete accounting system and doesn’t pretend to be that. ProjAccount™ thinks the way Architects who design houses do: “How does what I’ve billed and what I’m going to bill relate to my overall fee percentage? ProjAccount™ does that. 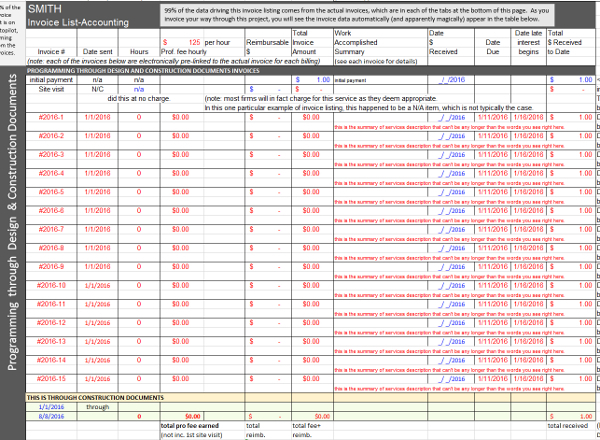 It also has each of the invoices pre-linked to the master Invoice List. In fact, 99% of the Master Invoice List is fully automated; the information magically appears, as you produce your invoices for your project. It gives you a running total of how much you have invoiced and when your Client has paid and for what. This does Not link to QuickBooks and related programs, unless you have IT people that are capable of linking such database programs to Excel spreadsheets. ArCH ProjAccount (C) Copyright 2016, Home Architect, PLLC, All Rights Reserved Worldwide. Illustrating just a portion of the Invoice List sheet. However, ProjAccount™ provides one of the easiest to use semi-automated invoice templates in existence, especially made for Architects who design homes, and provides a near-total automation and summation of their running total. This thinks like you do. Easy to use. ProjAccount™ is actually the combination of 2 ArCHproducts: ArCHinvoice™ and ProjAccount™. However, instead of a single invoice that you receive with the solo product ArCHinvoice™, you receive 39 invoices, preformatted and prelinked to ProjAccount™, which provides much more functionality: an aggregation of all of your invoices for any given project, allowing you to understand how much you’ve billed on any project and for what. No more pawing through individual invoices: those are automatically totaled for you. The Master Invoice List is broken into 2 main sections: Programming through Construction Documents and then Bidding through Construction Administration, which is how nearly every Architect views his business: one: document creation, then other administering the use of the documents. ProjAccount™ is not what your staff uses to log their hours. You’re going to need to know how many hours your firm has spent for each day doing what, and type that information into the electronic ArCHinvoice™, so that the Master Invoice List understands what has happened for each day. Once again, unless you have IT people that can link another program to ProjAccount™. But the functionality provided over using a paper-based system is huge. And will allow you answer questions and better plan the income of your firm better than ever. Look here to see: ArCHinvoice™, which is included (39 times) in the ProjAccount™ application.